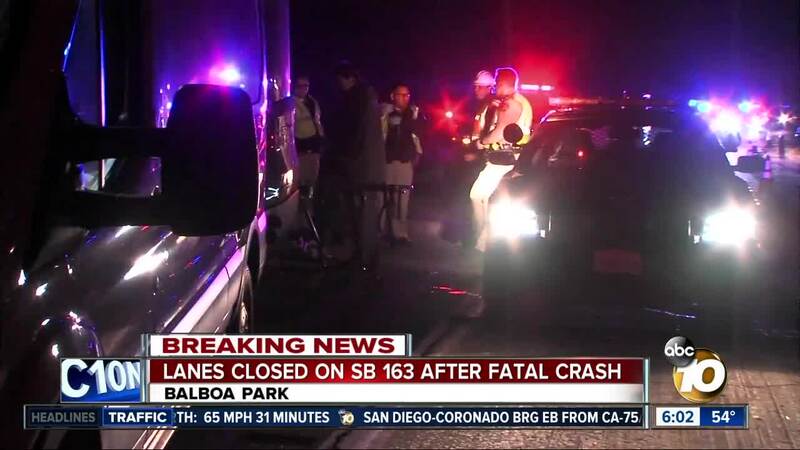 SAN DIEGO (KGTV) -- One person was killed and three others were injured in an early Saturday morning crash involving two cars along the southbound lanes of SR-163 in Balboa Park. The incident happened around 2:30 a.m. on the Cabrillo Highway just south of the Quince Street overpass, according to the California Highway Patrol. The driver of a Lexus sedan rear-ended a Mazda sedan sending both cars off the highway. One of the vehicles tumbled down an embankment into a drainage ditch. The Madza was carrying two rideshare passengers in the rear seats, according to CHP. One of the passengers was pronounced dead at the scene, according to CHP. The other rear passenger was ejected out of the car causing the victim to suffer major injuries. Drivers of both vehicles are being treated for injuries. Investigators are working to determine the cause of the accident. It is unknown at this time if alcohol or drugs were a factor in the crash. All southbound lanes were temporarily shut down. The CHP reopened a single lane while crews continue to work to clear the scene.